Summary: ALWAYS LOOK NORTH, and expect it to be dim. The Ovation Model  – a prediction: bright green, yellow or red overlapping Seattle means go outside and look. 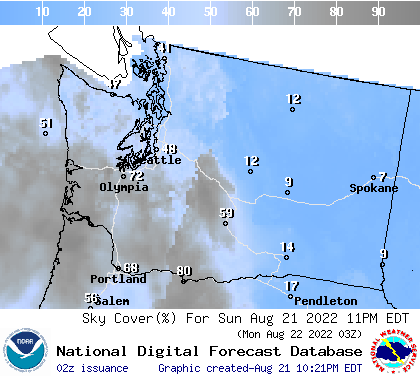 Soft Serve News  – a prediction: Kp over 5 means possible aurora for Seattle, but the higher the better. If it hits 6 go outside. Current Activity, Estimated Kp , – a measurement: Kp over 5 is good news. Remember the date/time along the bottom are in Universal Time so subtract 7 or 8 hours depending on daylight savings. Advanced Solar Wind Charge/Direction  – a measurement: scroll down. On the left under “Real Time Solar Wind” is a little speedometer thing labeled “Bz.” When this is pointed towards S/-50/Red we have better auroras in the Northern Hemisphere. When it is pointed the other way, the Southern Hemisphere has better aurora. NOAA’s Space Weather Prediction Center  – LOTS of info in one place. When: Use Timeanddate.com  to convert aurora prediction times from UTC to Pacific Daylight or Standard Time. When Kp levels surpass 5 it is worth starting to check in. In Seattle, we hope for Kp levels of 6 or greater for the best chance to see the aurora. I explained Kp over here . My general stargazing location recommendations .